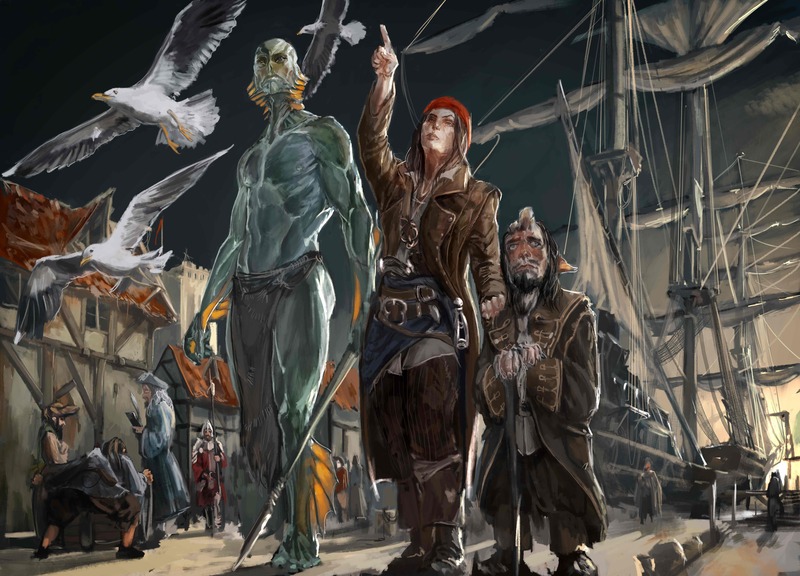 We’re bringing the Freeport Companion to Shadow of the Demon Lord! Orcs, pirates, the Unspeakable One, ancient empires, the Yellow Sign, insidious cults: Freeport has all these and so much more. In a few weeks, I’m launching a Kickstarter campaign to fund the production of the Shadow of the Demon Lord Freeport Companion, a 128-page, full color sourcebook that gives you everything you need to bring the City of Adventure to the world of the Demon Lord. As with the Shadow campaign almost two years ago, I already have the book written and ready to move into the editing and art direction phases. While the text is in hand, the production costs for a book this size are more than I have on hand, so I’m asking you for help. To get this book through production, I need $10,000. This amount will cover editing, art, and layout, ensuring the book meets the high standards to which we hold every release. Backers of the Freeport Companion will have four pledge options: to get the PDF, the PDF and printed book, the PDF and printed book along with all stretch goals, or the PDF of the book and all the stretch goals. Retailers can also back this campaign and will get ten copies of the rulebook. What does the Freeport Companion contain? A massive adventure to help you explore Freeport and kick off your Freeport campaign! The first Freeport Companion stretch goal unlocks when we hit $20,000, and stretch goal backers will all get PDFs of the original Freeport Trilogy for use with Shadow of the Demon Lord and updated with all new art. Other stretch goals will include Beyond the World’s Edge, a supplement that explores new lands and civilizations, Tales of the Pirate Isles, a trilogy of nautical themed adventures, and, the Demon Lord’s Companion 2, a book that will add even more options to the game. This time around, we’ll be shipping printed rewards to international backers directly from the printer, which saves us all loads and loads of money. US backers should receive their copies 1-3 weeks after shipping, while international backers should receive their copies 3-7 weeks after shipping. Easy peasy. Please note that delivery estimates are for PDF of the Shadow of the Demon Lord Freeport Companion; add shipping time to the delivery dates for printed materials. Similarly, any products unlocked in the stretch goals will be delivered when as they are ready. We’re launching the Kickstarter on March 1st, and it will wrap up on March 18th. Even if you can’t back the campaign, you can still help by spreading the word, sharing updates, and singing the game’s praises. Anything you can do to get out the word will not only make this project a reality, but also help us continue to produce dark and sinister supplements and games. Thanks in advance for your help and I hope you join us on March 1st. Want to see why Freeport is so awesome? Grab the Pirate’s Guide to Freeport today!